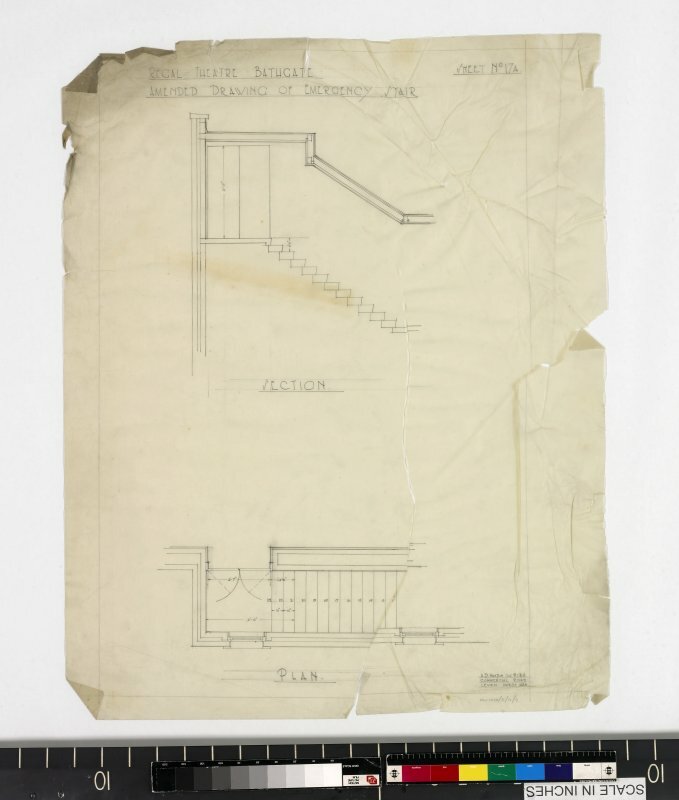 Details of pre-cast terrazzo steps from entrance hall to foyer. 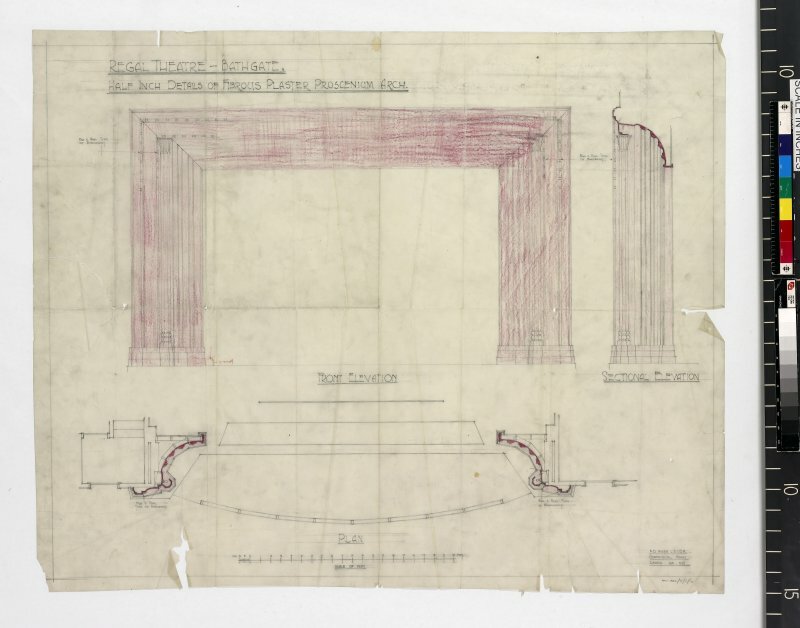 Details of fibrous plaster proscenium arch. 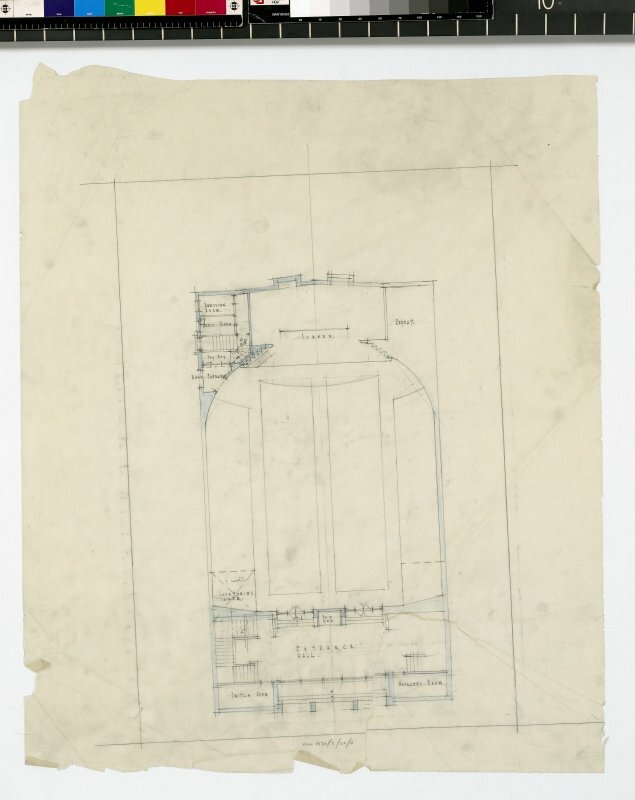 Floor plan showing entrance hall, auditorium and screen. 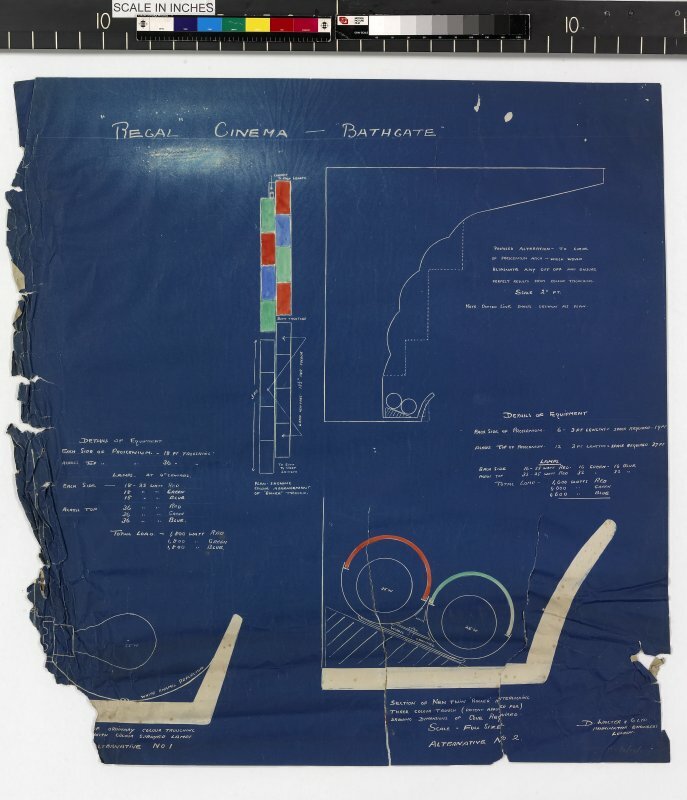 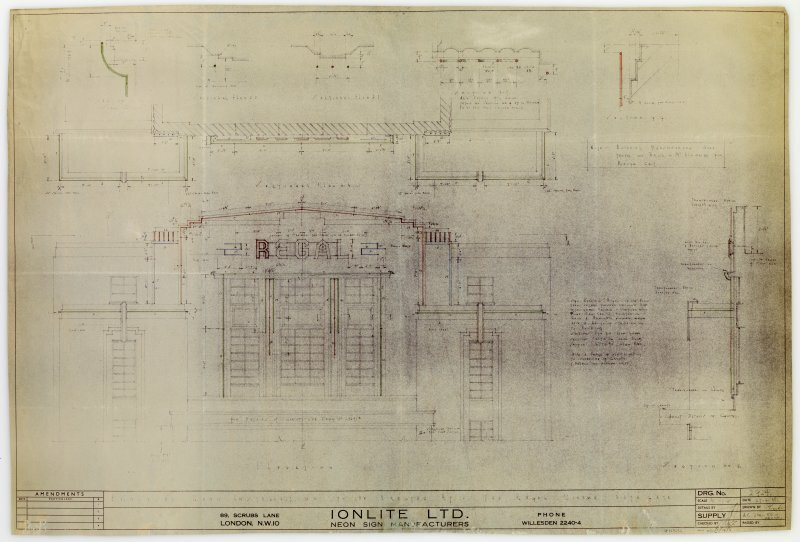 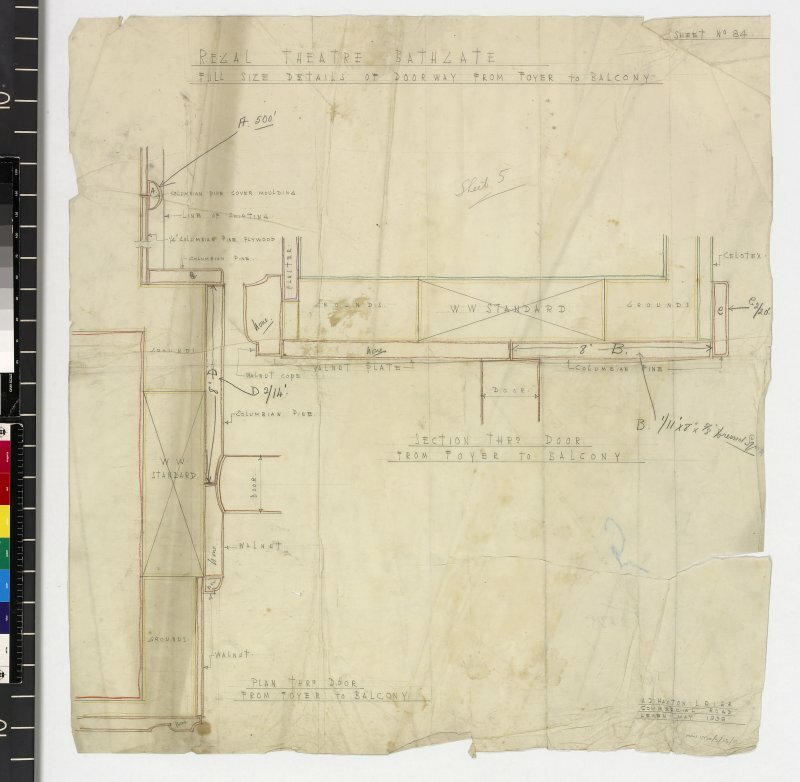 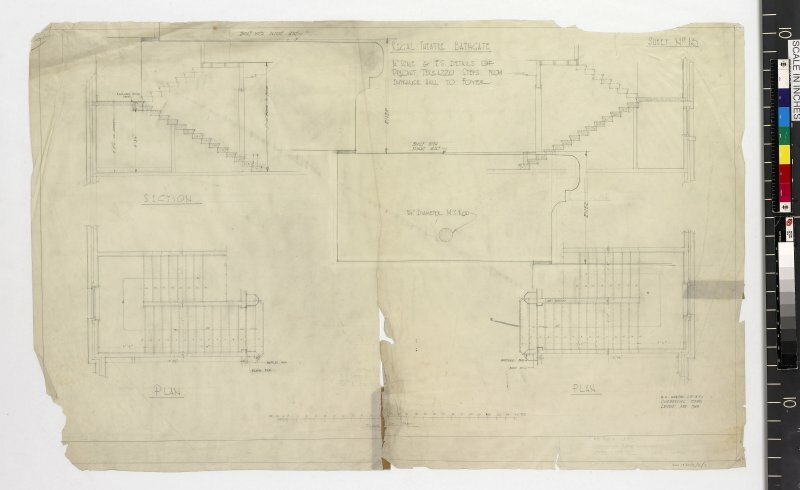 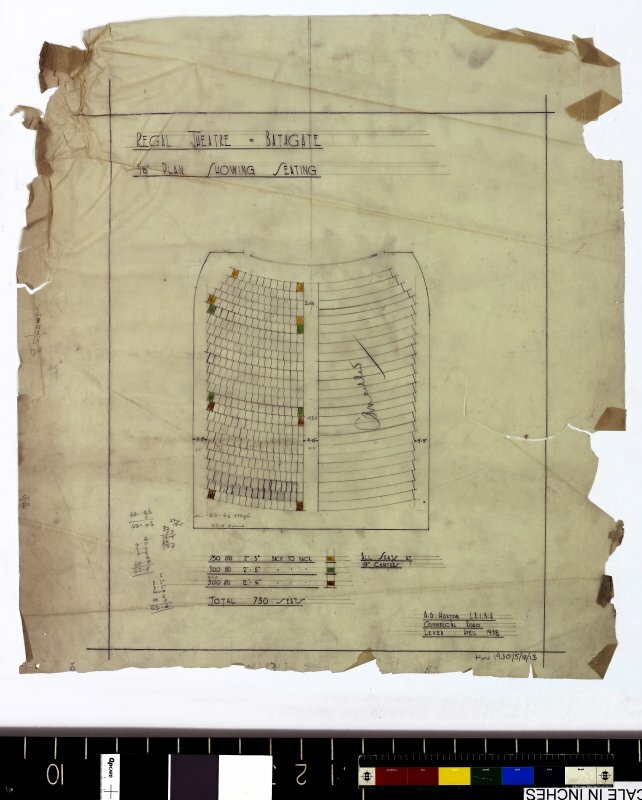 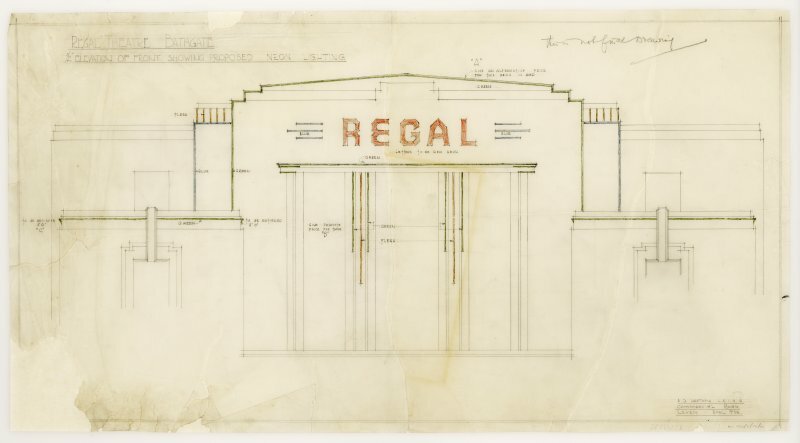 Regal Cinema for Star Theatre (Bathgate) Ltd. Elevation showing lighting scheme. 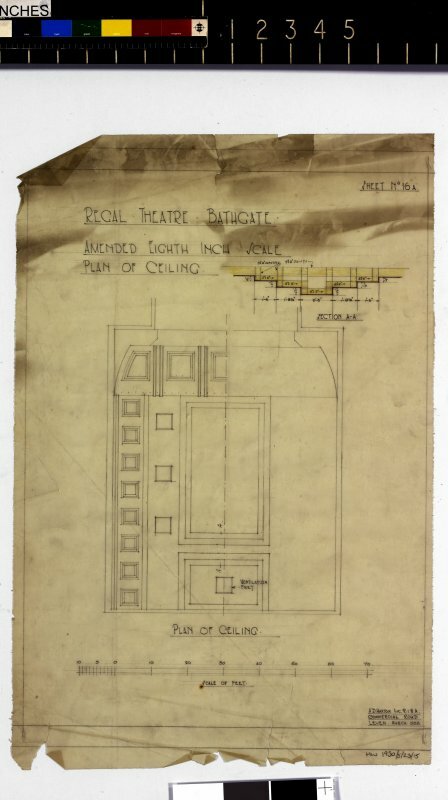 Reflected plan of proposed new canopy scheme. 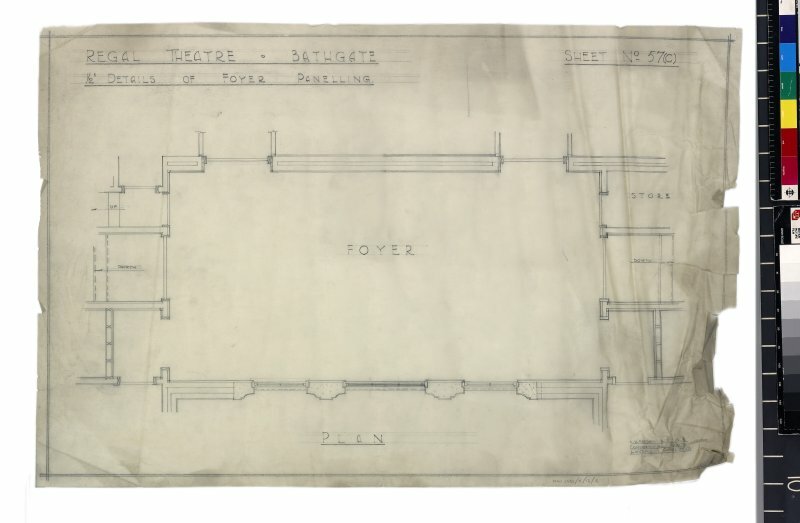 Details of pannelling in entrance hall. 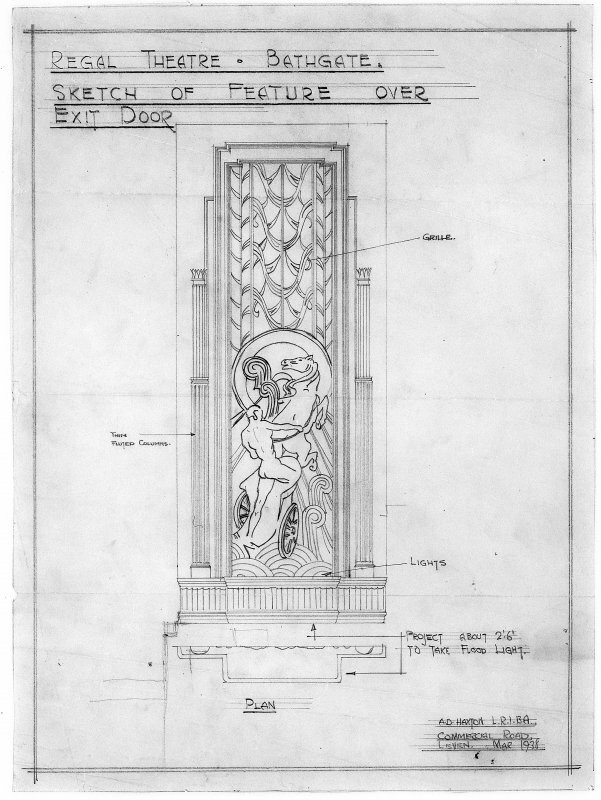 Detail showing decorative feature over exit door of auditorium. 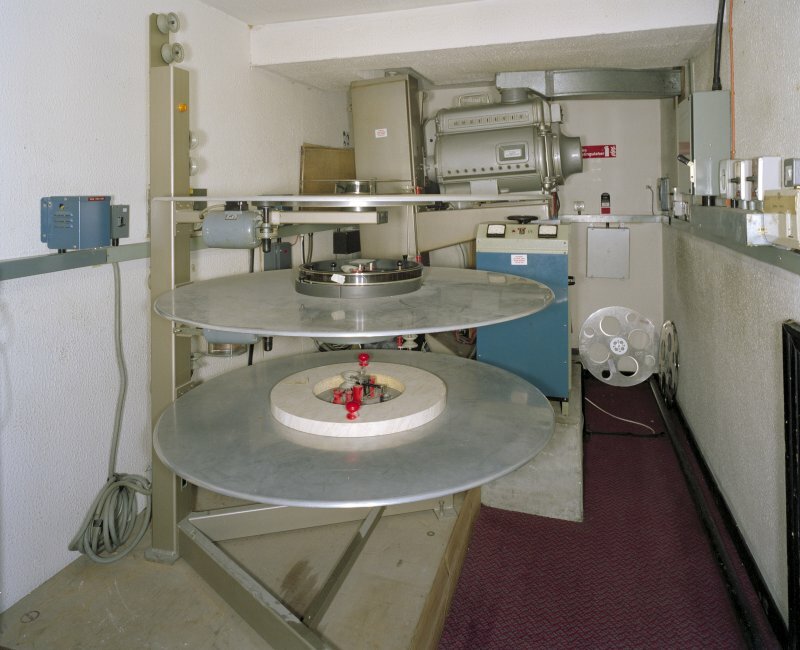 Scanned image of E 26301. 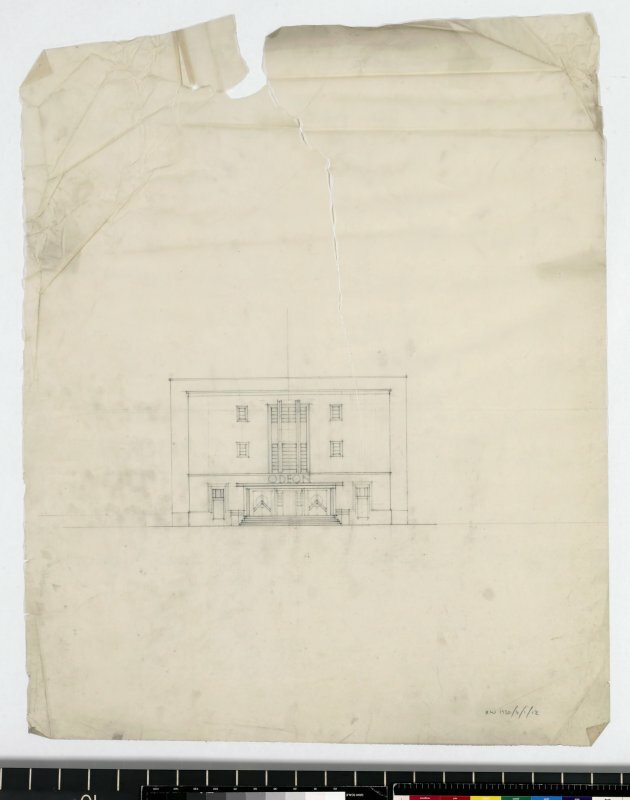 Perspective elevation. 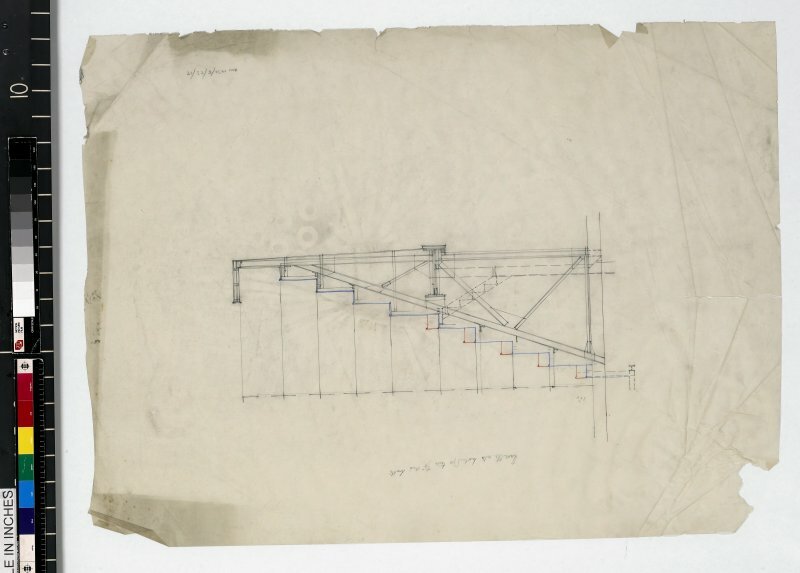 Scanned image of E 33744 CN. 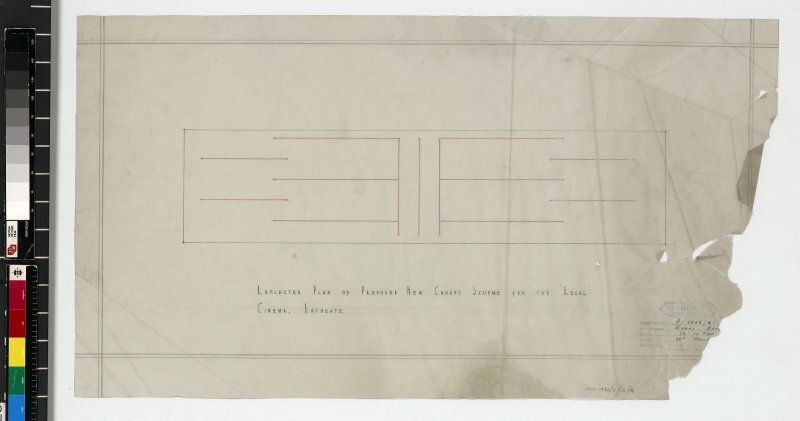 Details of front showing proposed neon lighting. 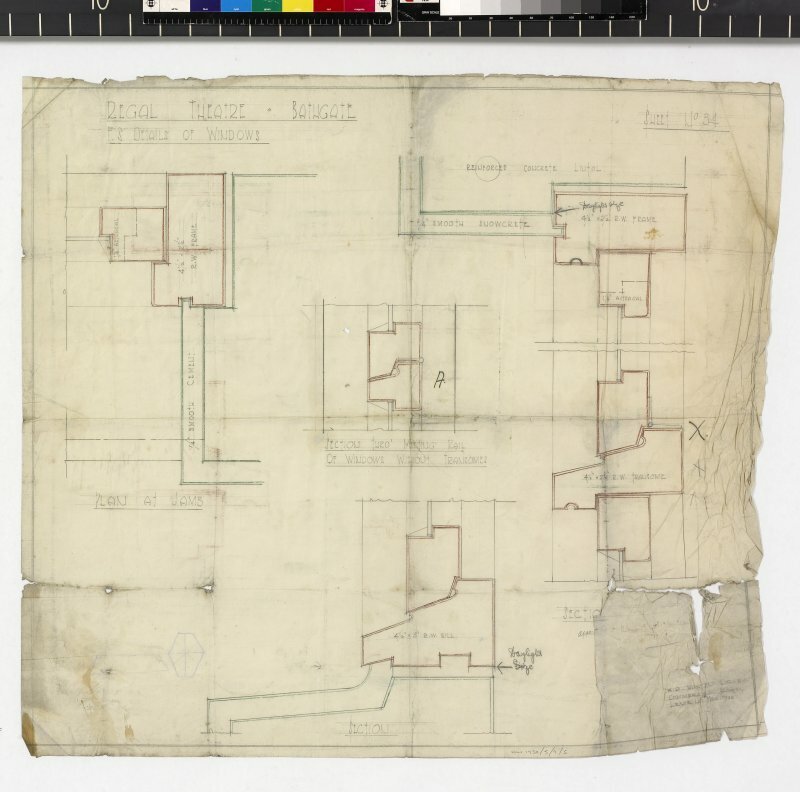 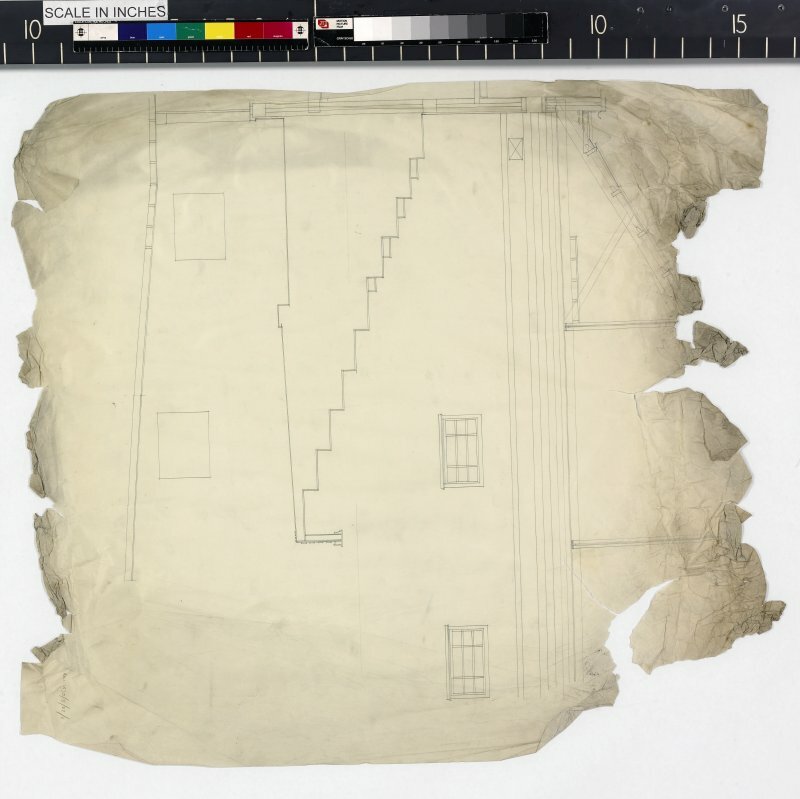 Drawing after conservation. 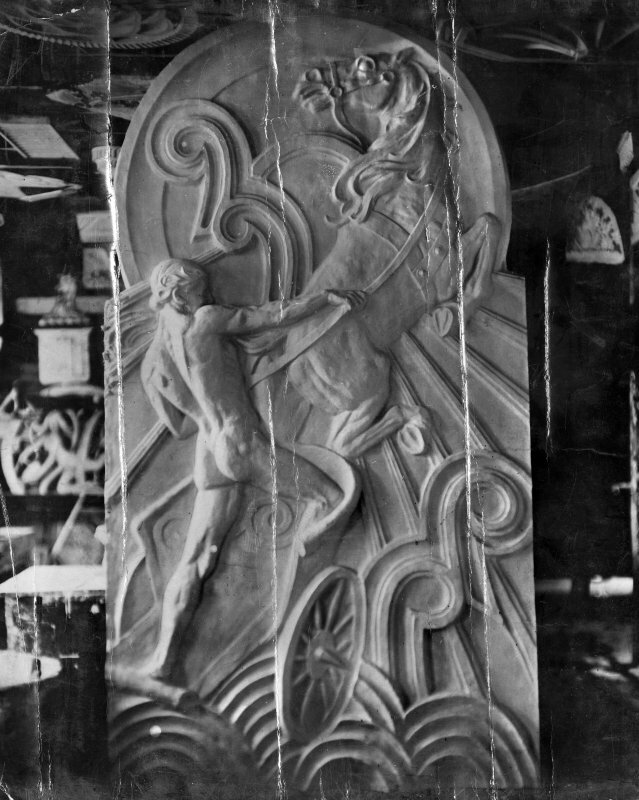 Details of panelling in entrance hall. 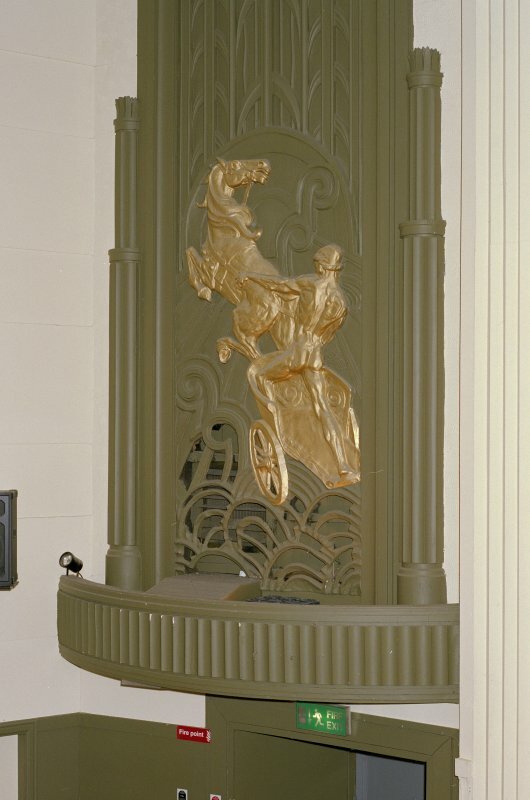 View of decorative feature of charioteer before installation over exit door of auditorium, Regal Cinema, Bathgate. 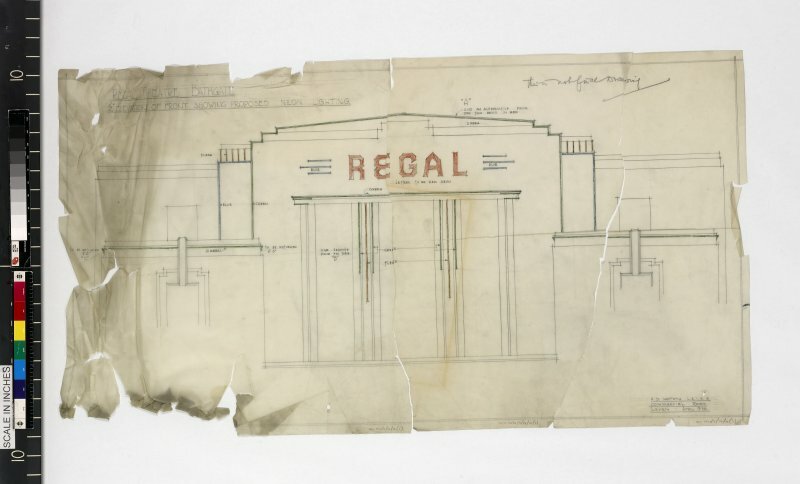 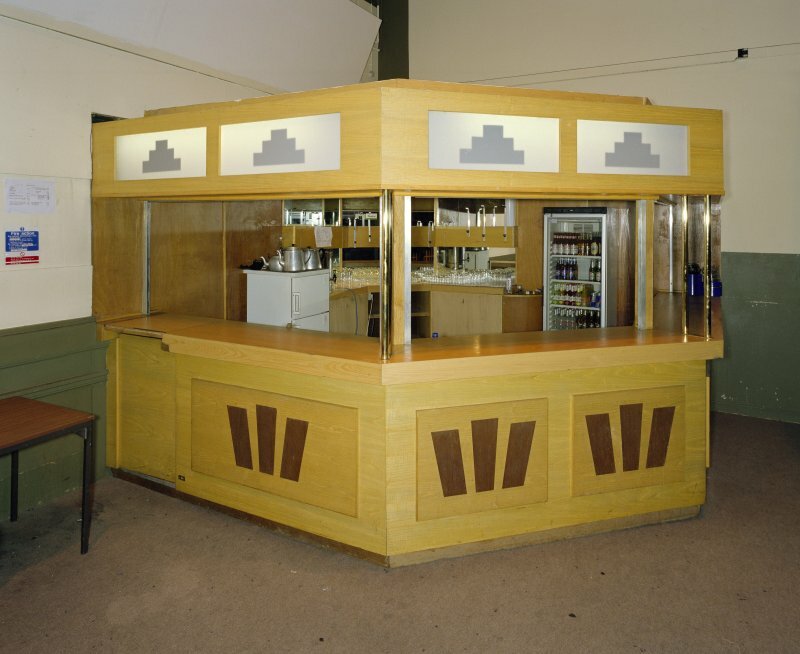 Regal Cinema for Star Theatre (Bathgate) Ltd. 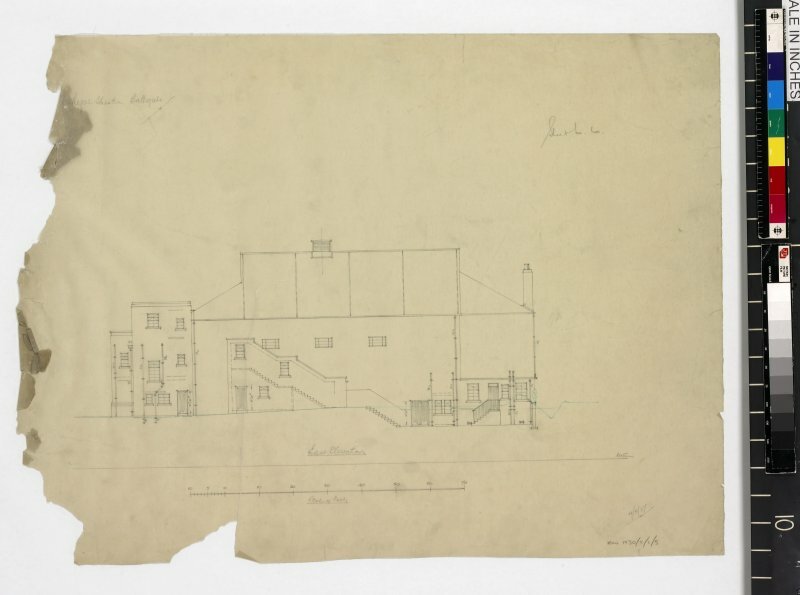 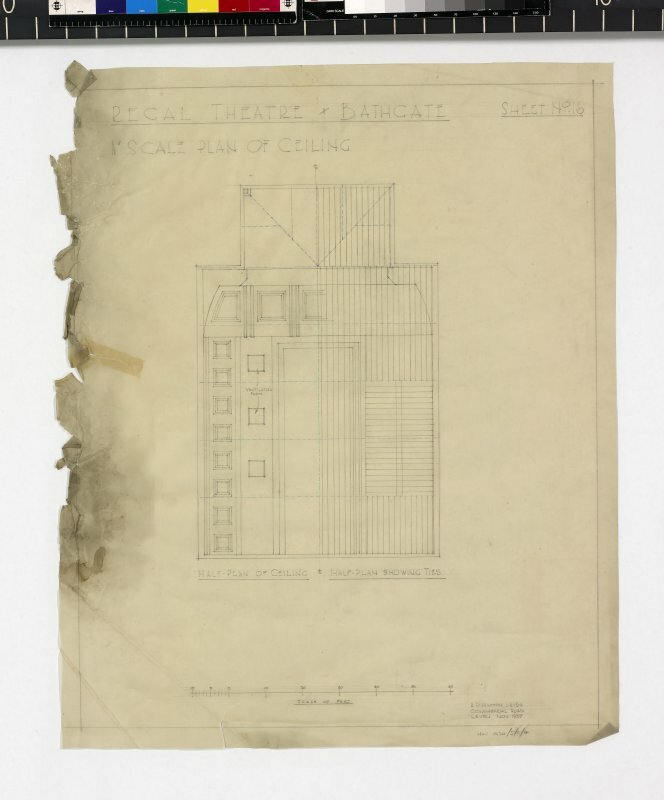 Photographic copy of section and elevation. 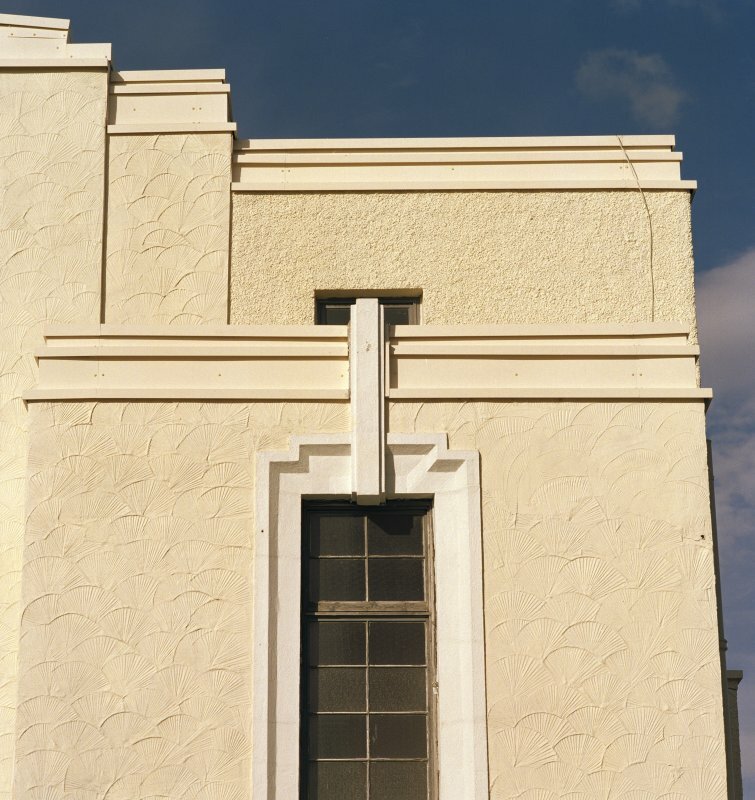 Detail of window showing surround. 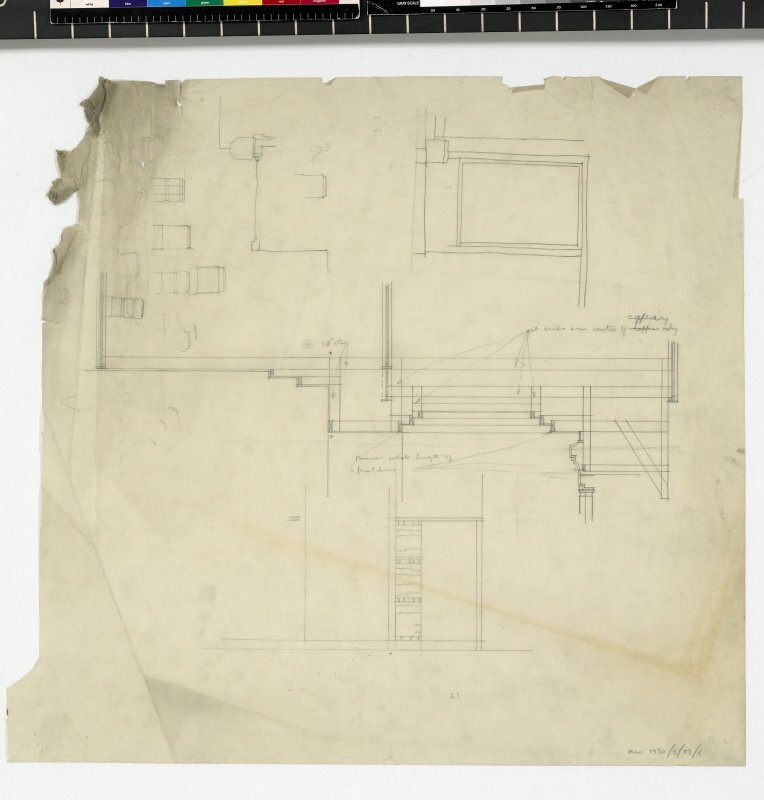 Cross section through main ceiling. 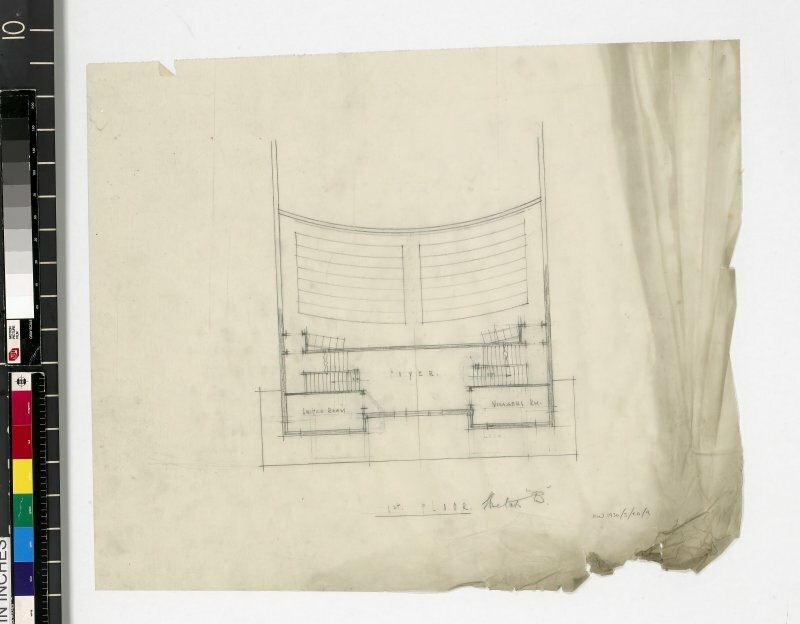 Detail of fibrocus plaster proscenium arch. 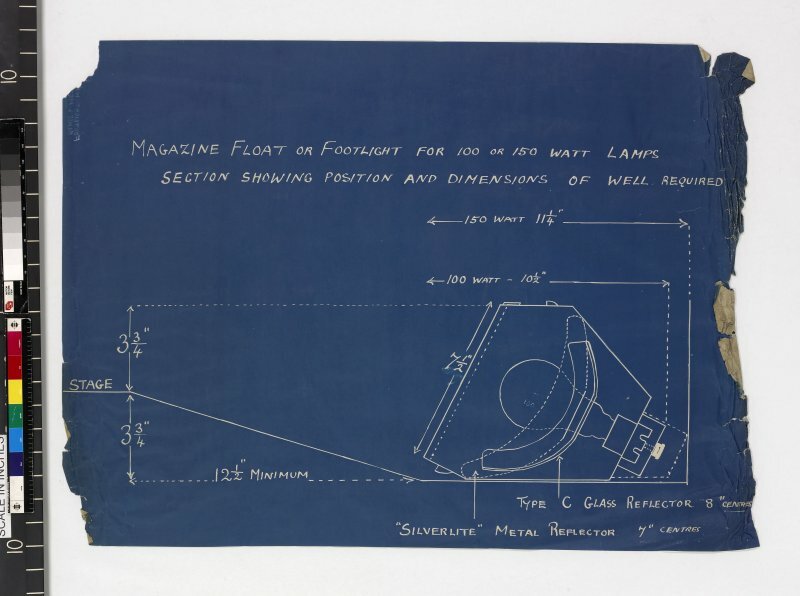 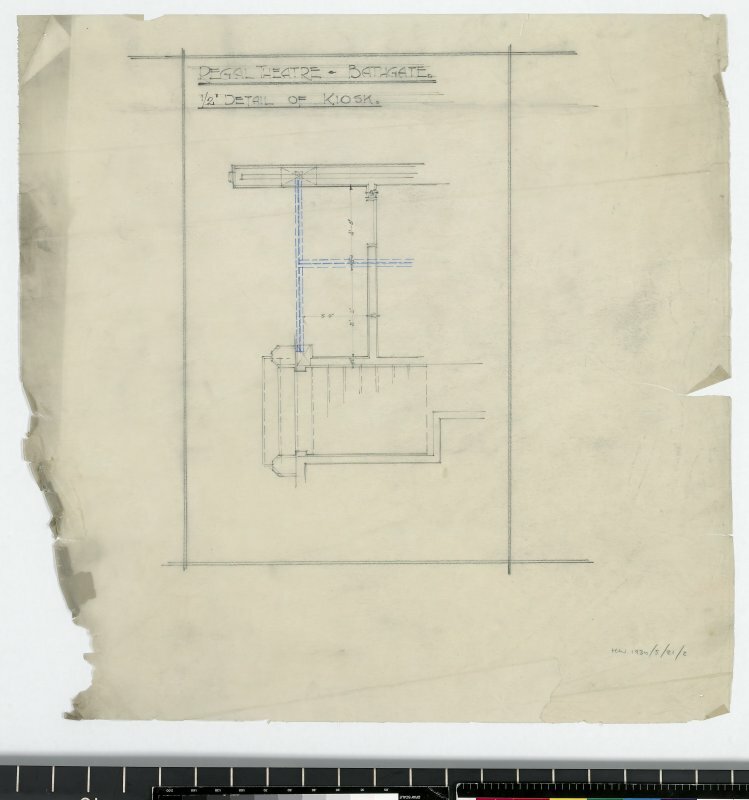 Section showing position and dimentions of well required for footlight lamps. 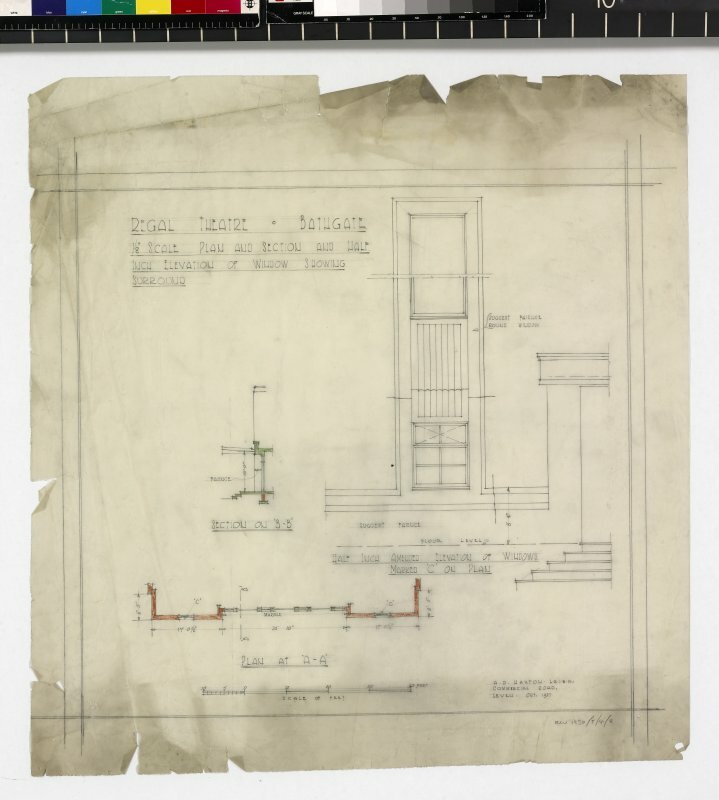 Details of panelling in foyer. 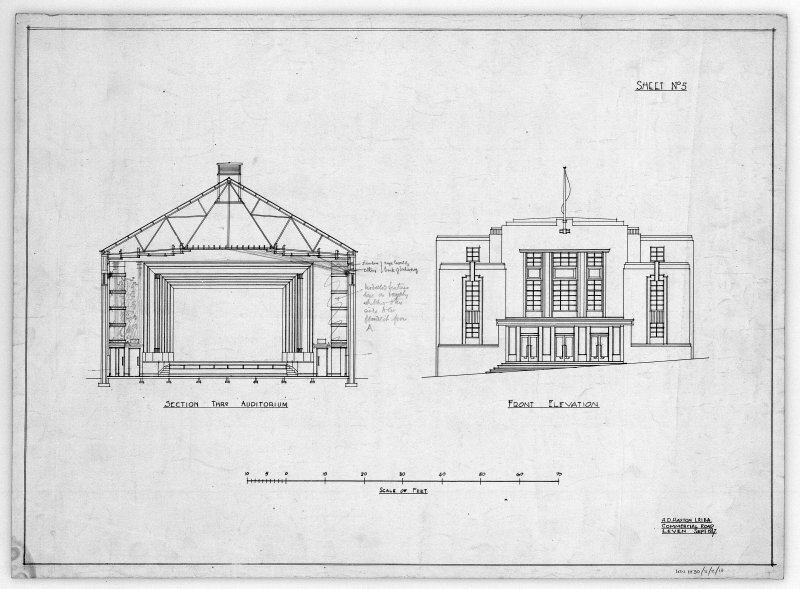 Plan and elevations of stage. 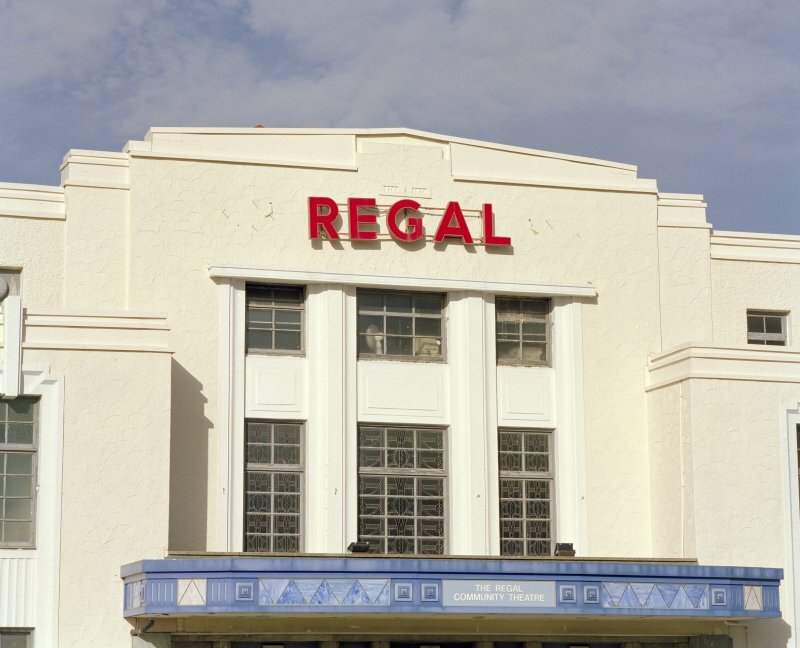 Detail of REGAL sign above main entrance to the Regal Cinema, Bathgate. 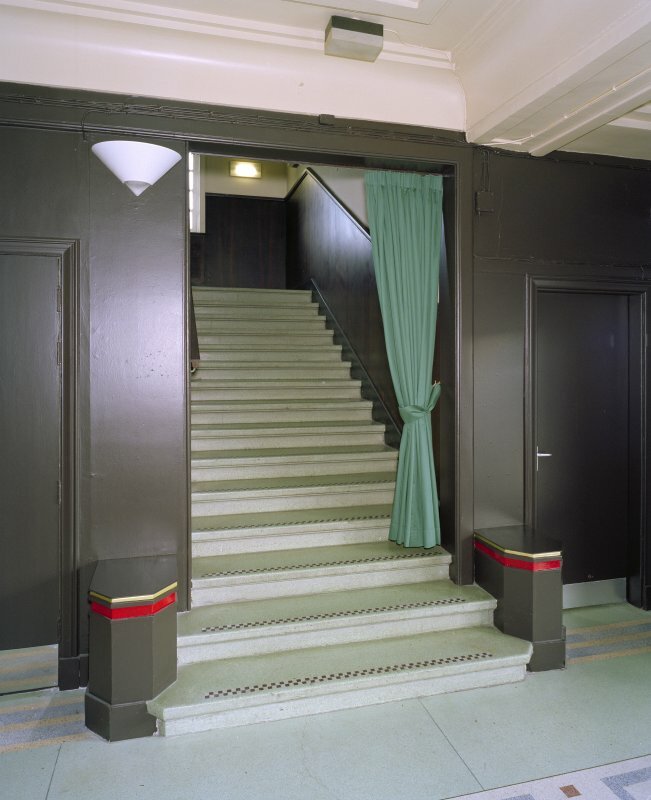 Details of doorway from foyer to balcony. 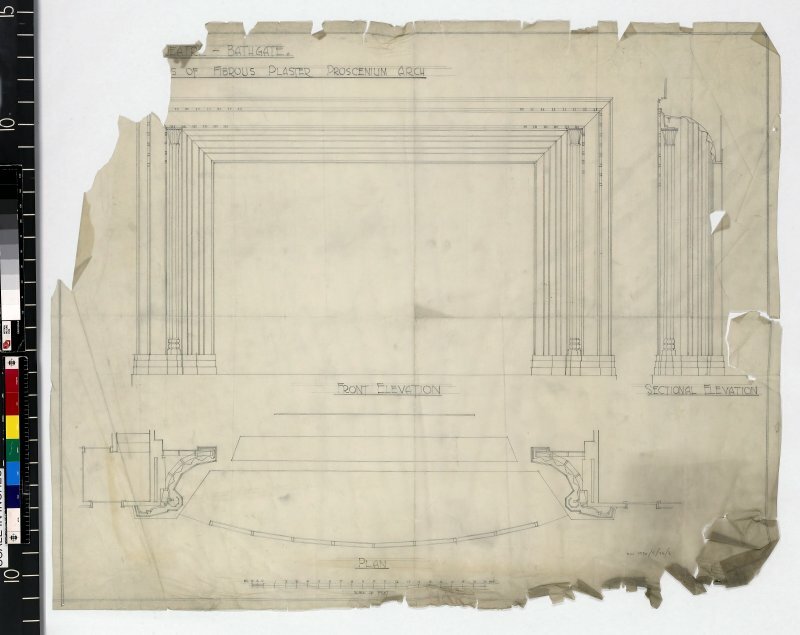 Detail of cornice in entrance hall. 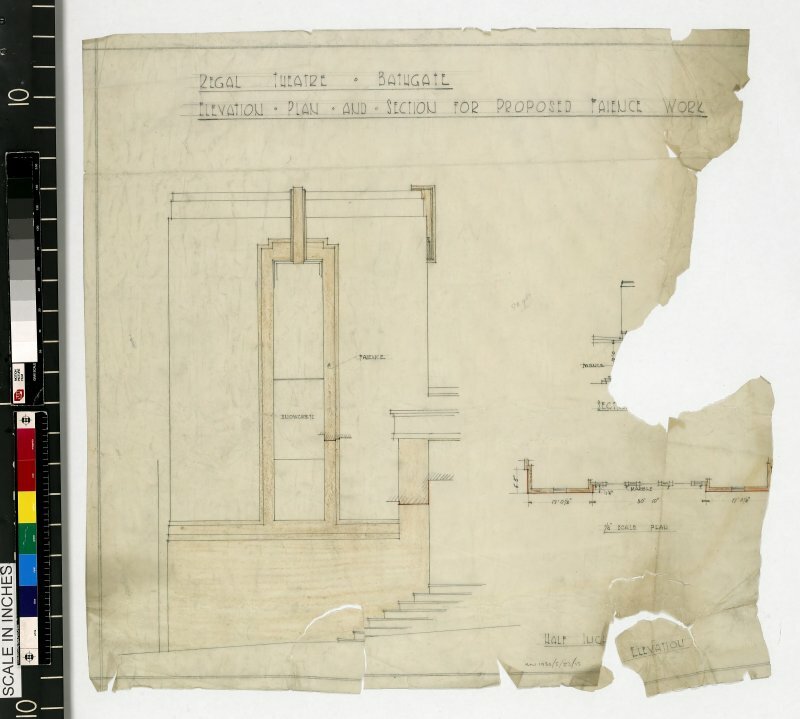 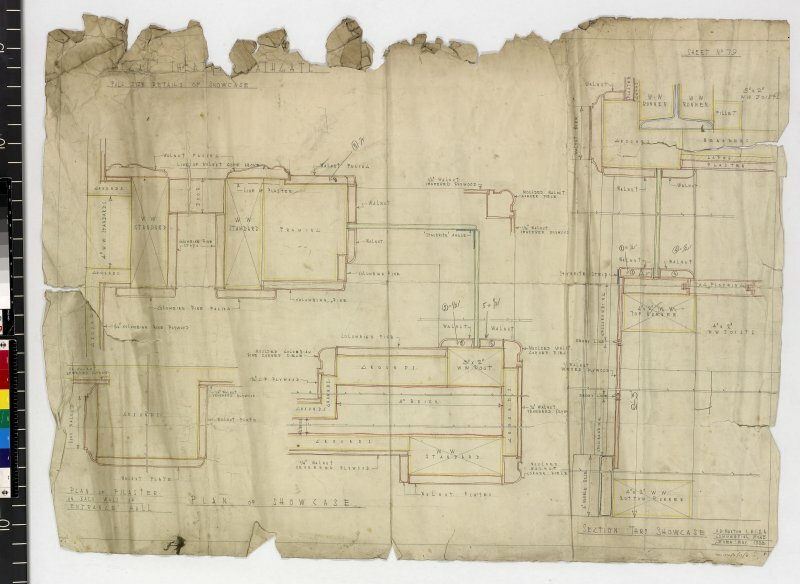 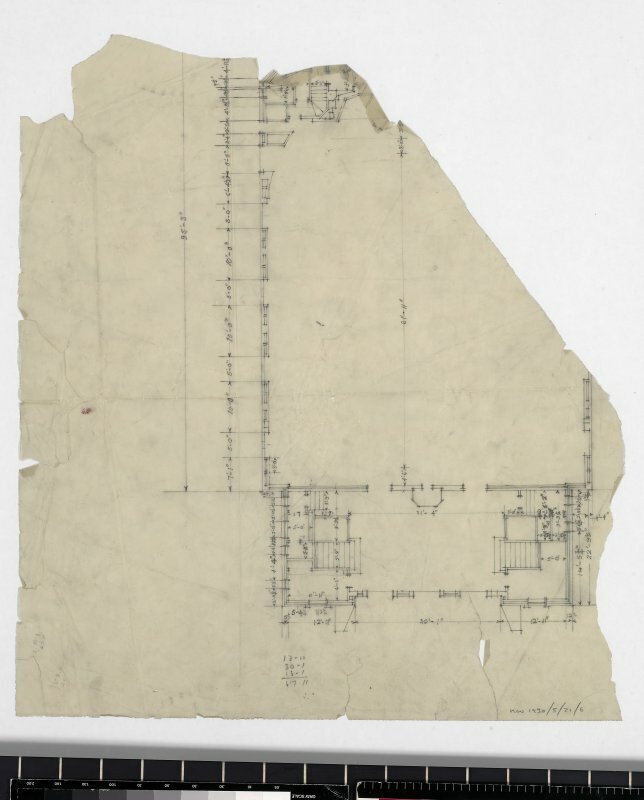 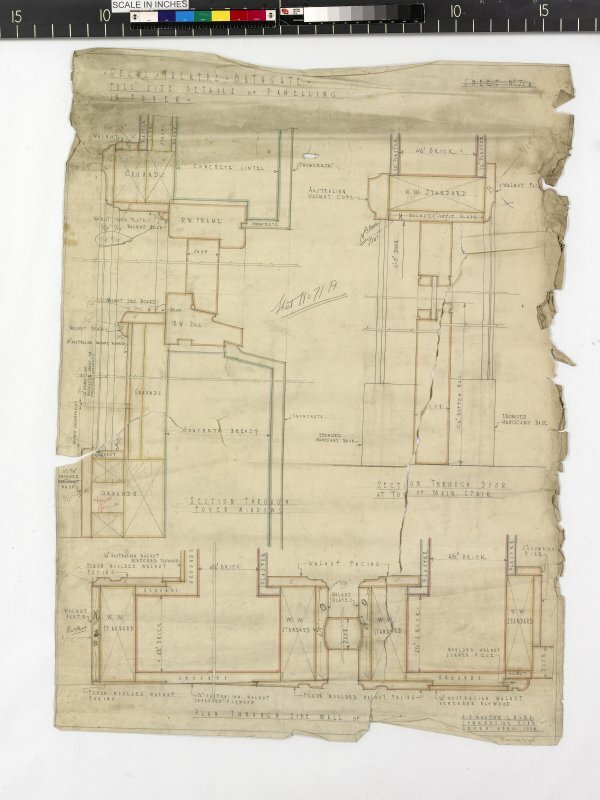 Elevation, plan and section for proposed faience work. 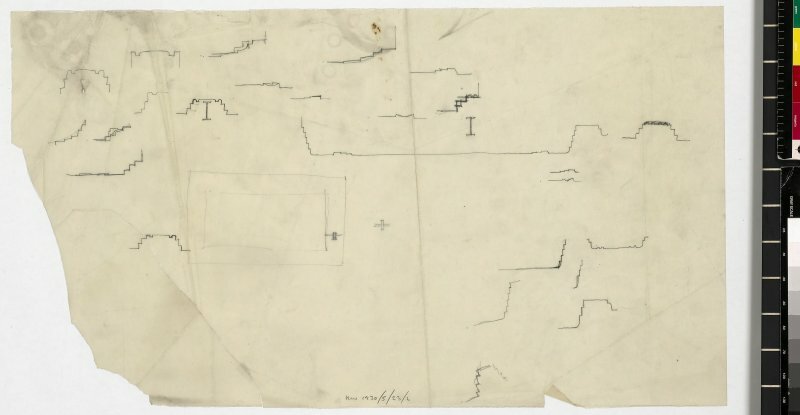 Floor plans of ground, first and second floors. 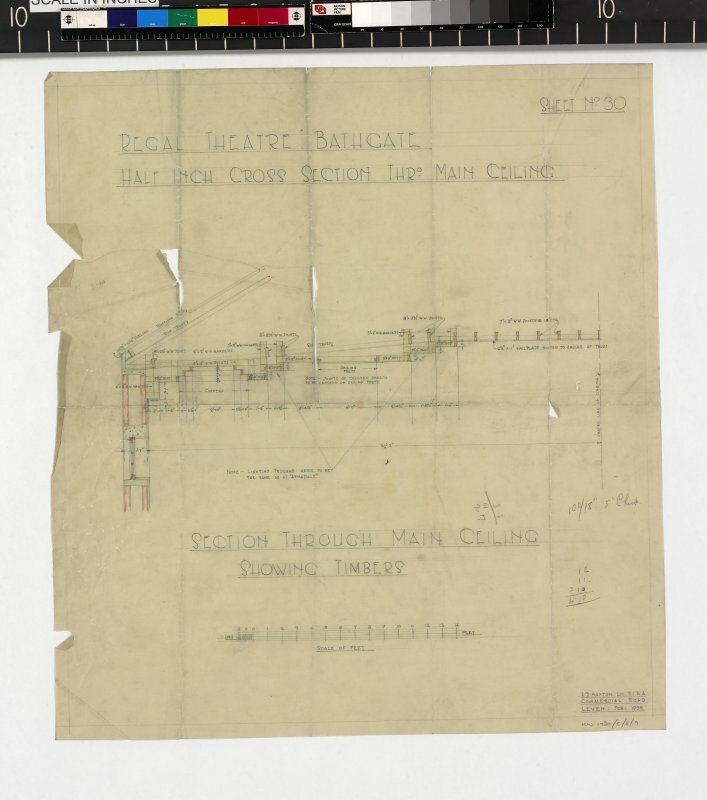 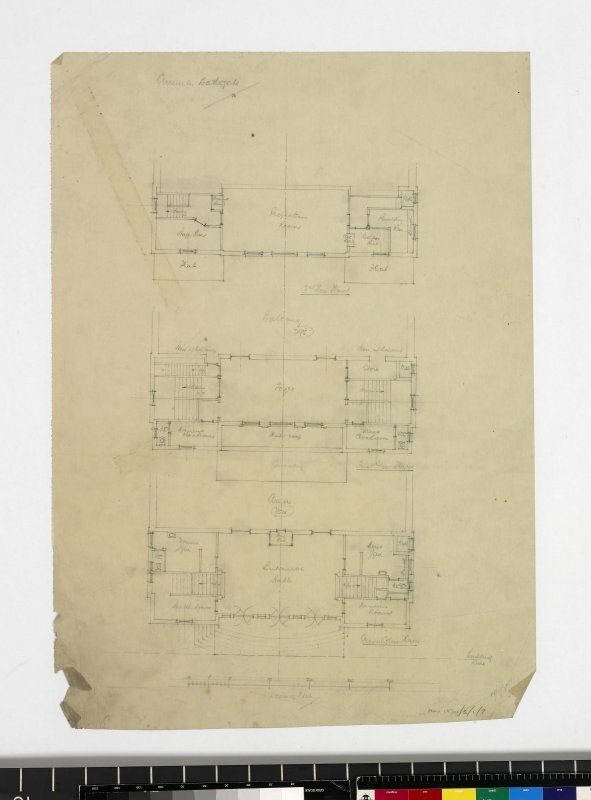 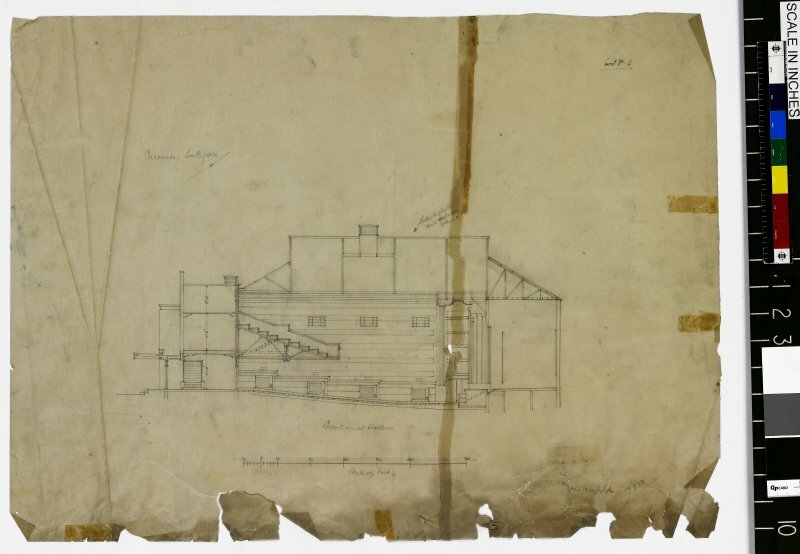 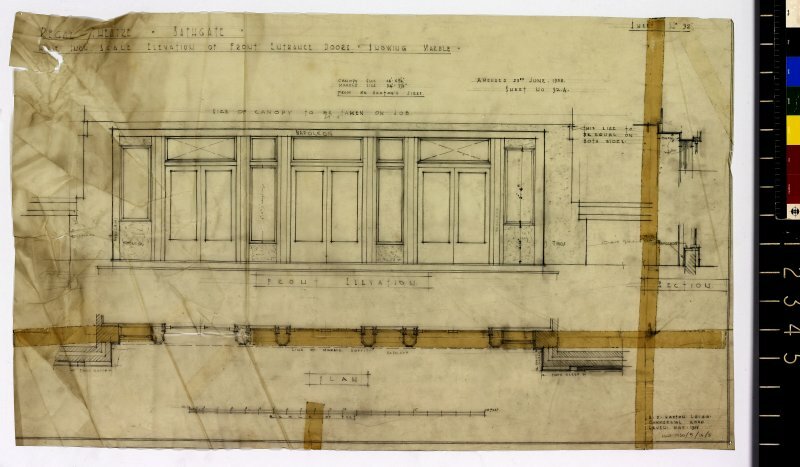 Elevations showing details of wall coverings in auditorium and balcony. 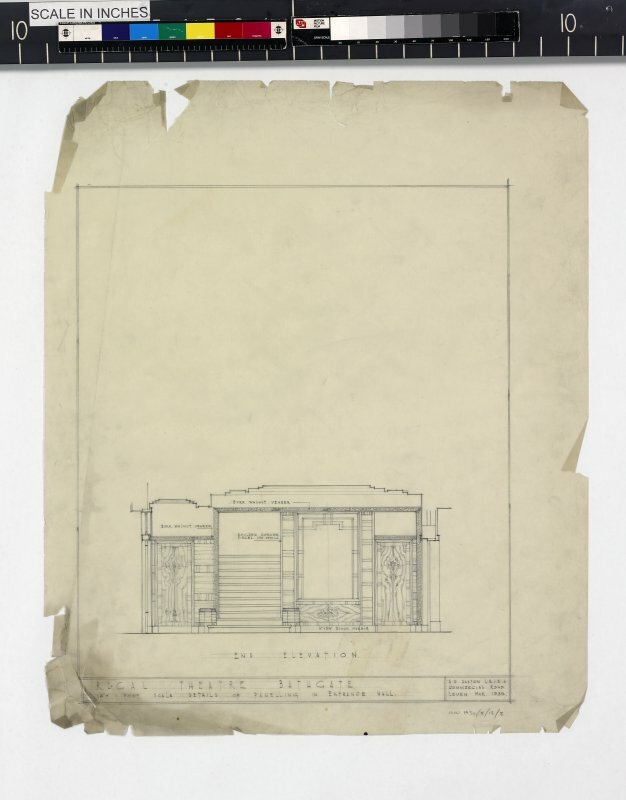 Elevation of front entrance doors showing marble. 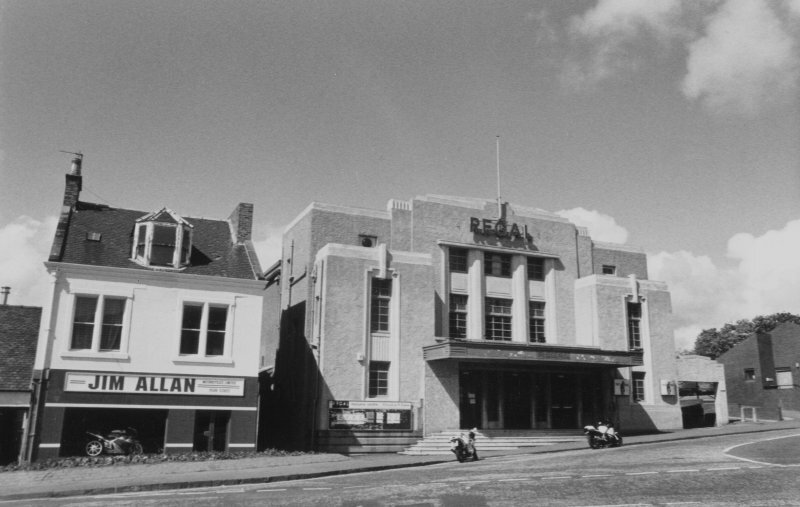 View of the Regal Cinema, Bathgate, from South. 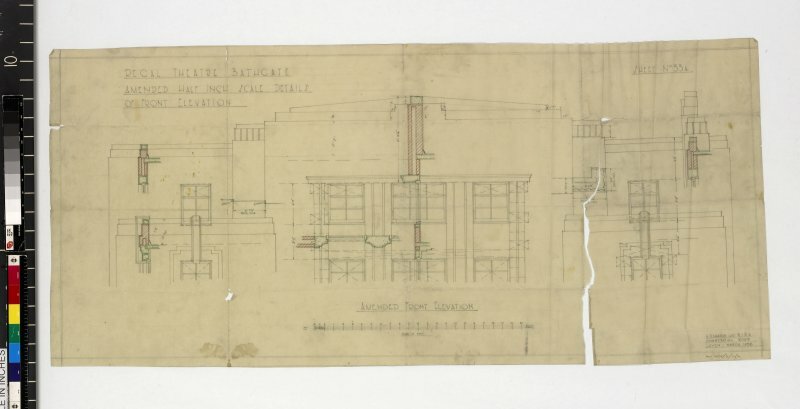 Details of front showing proposed neon lighting. 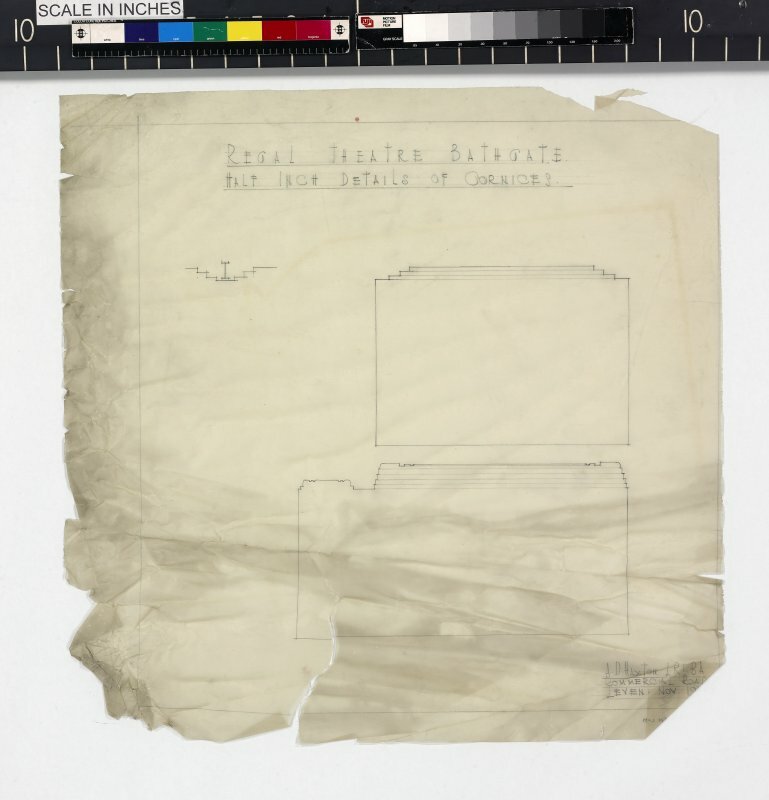 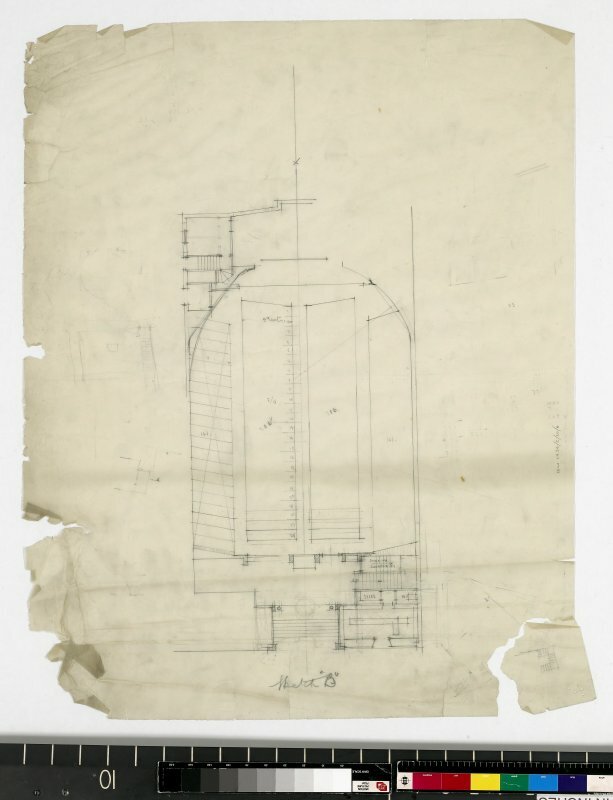 Drawing before conservation. 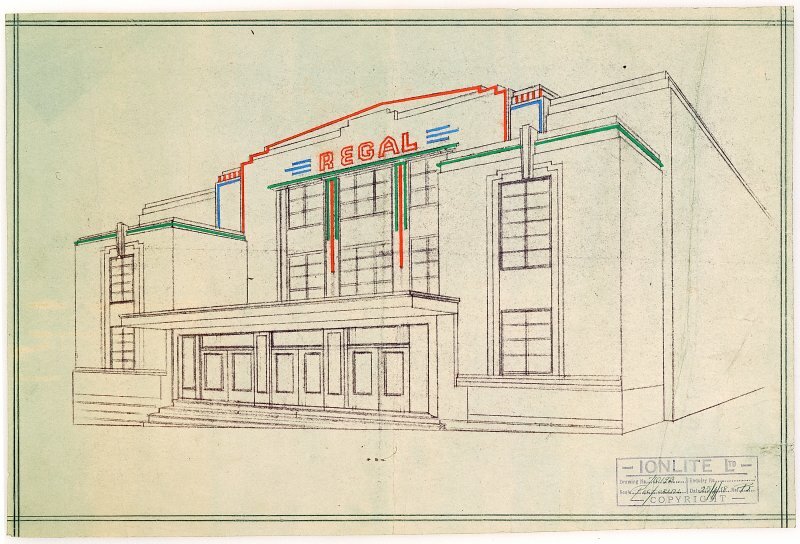 Regal indeed; a symmetrical design in roughcast and artificial stone, stair pavilions on either side mounting to an art deco pediment and flagpole. 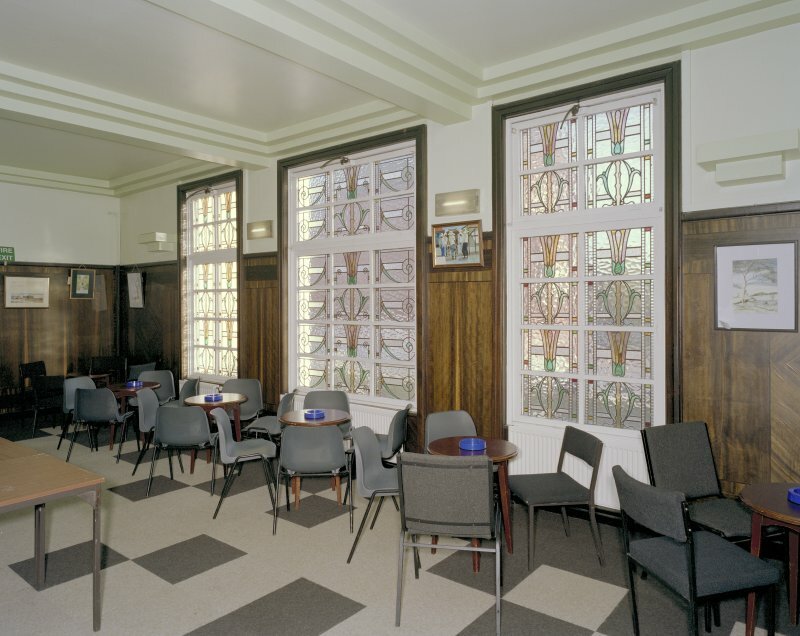 Floral stained glass in the first-floor foyer. 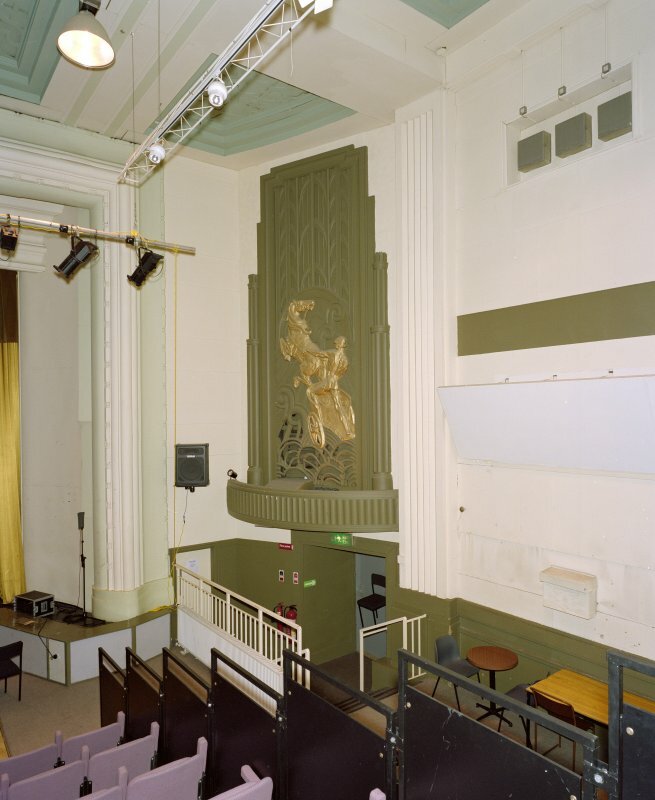 Notable interior scheme, including plaster reliefs, by John Alexander. 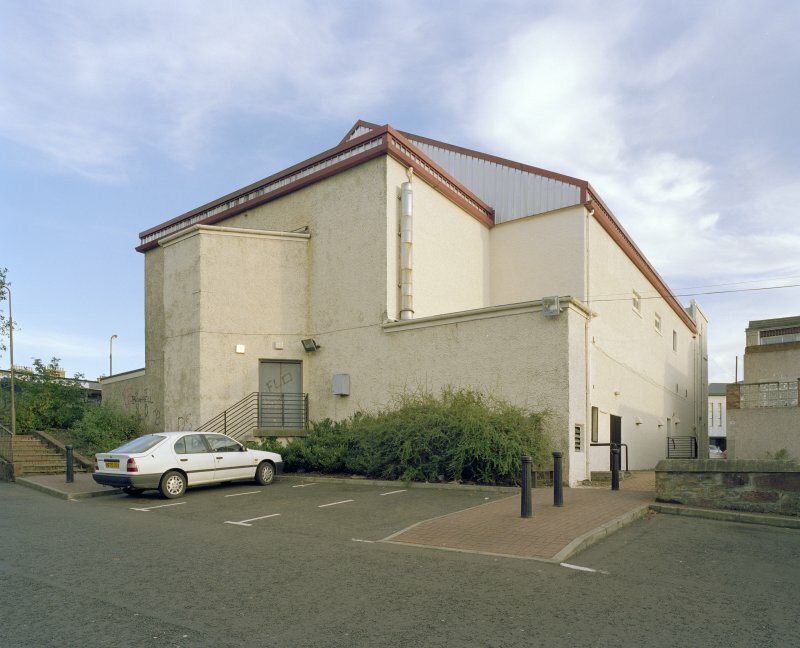 Adapted from cinema by Malcolm Fraser Architects, 2006. 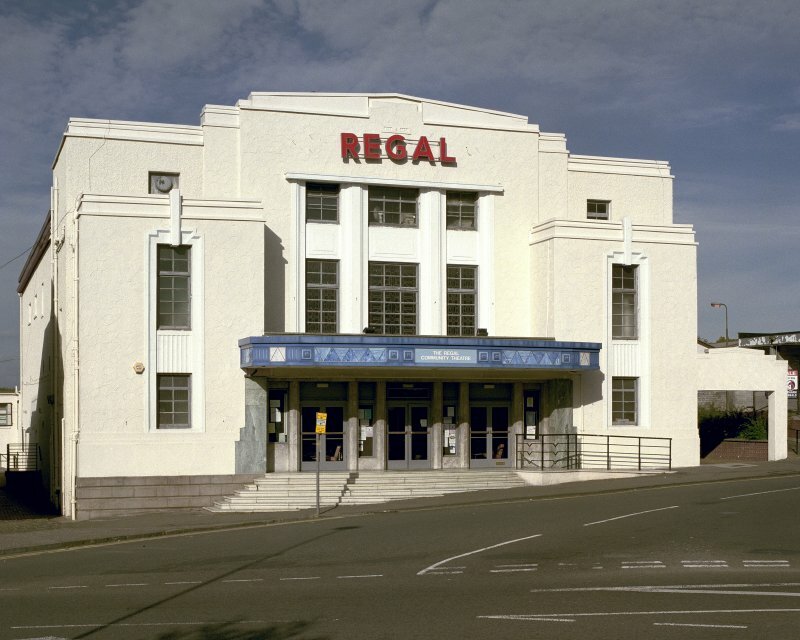 The Regal Cinema at 24-34 North Bridge Street, Bathgate, now the Regal Community Theatre, was designed by Andrew David Haxton (1878-1960) and built in 1938 in an Art Deco style. 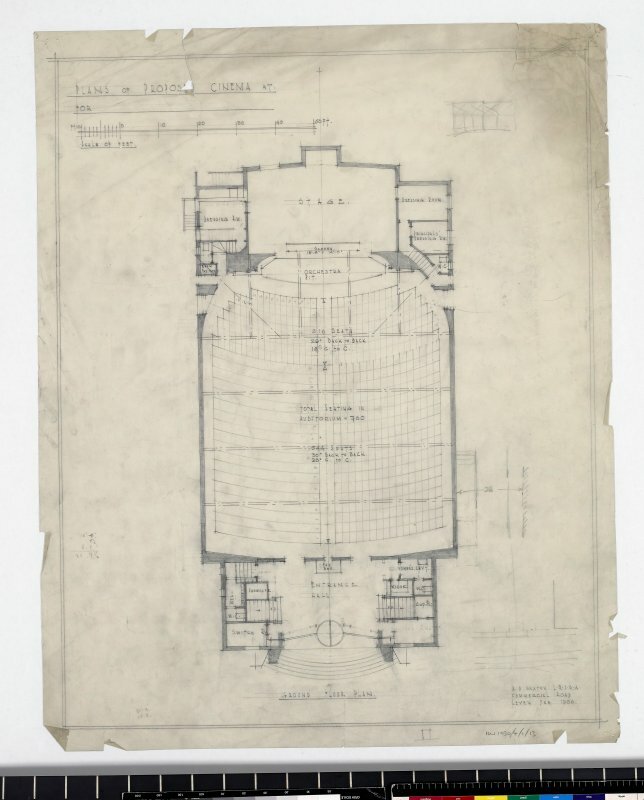 Laid out on a roughly rectangular plan on a site which slopes from east to west, it is of three storeys and has a five-bay entrance front with projecting bays to the east and west corners of the south (entrance) front. 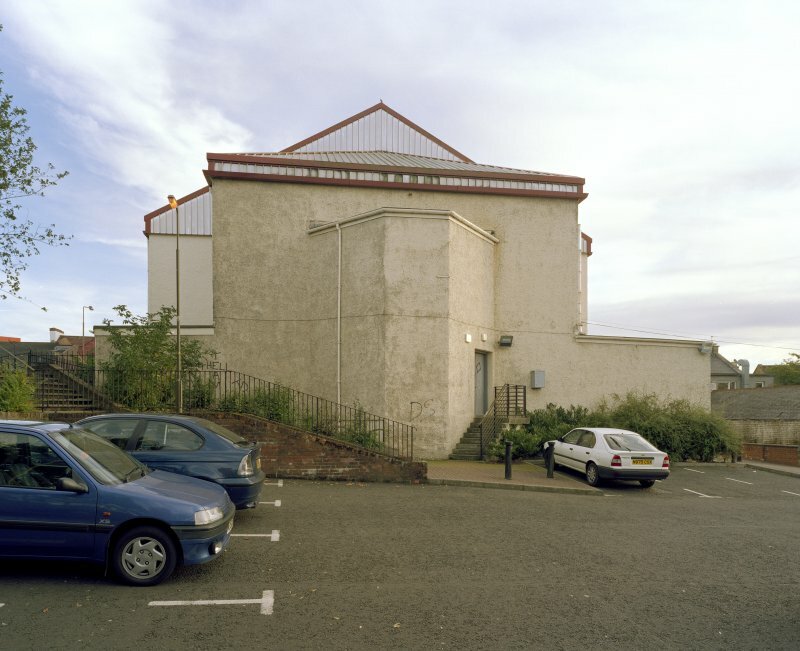 The building is harled or finished with fan-shaped rendering and has channeled masonry to the base course at the west end of the south front. 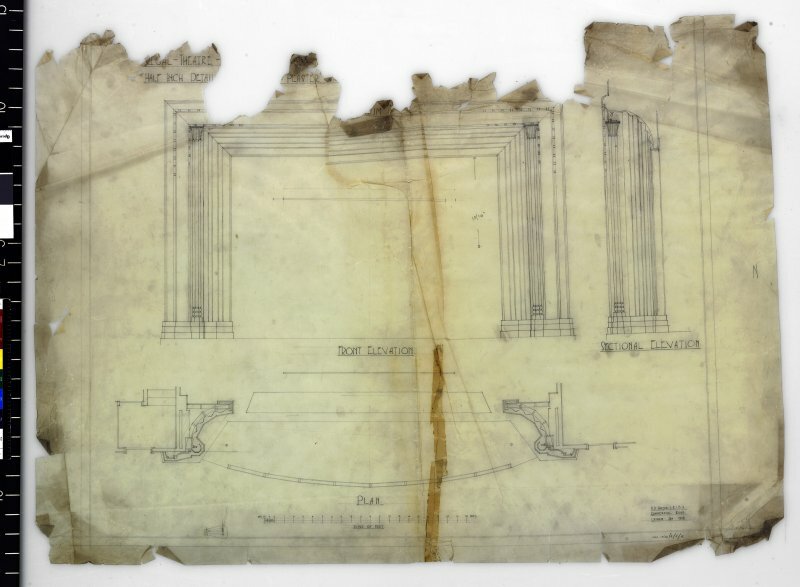 The central three bays are surmounted by a low pediment and the outer bays, at both levels, are terminated by stepped eaves courses. 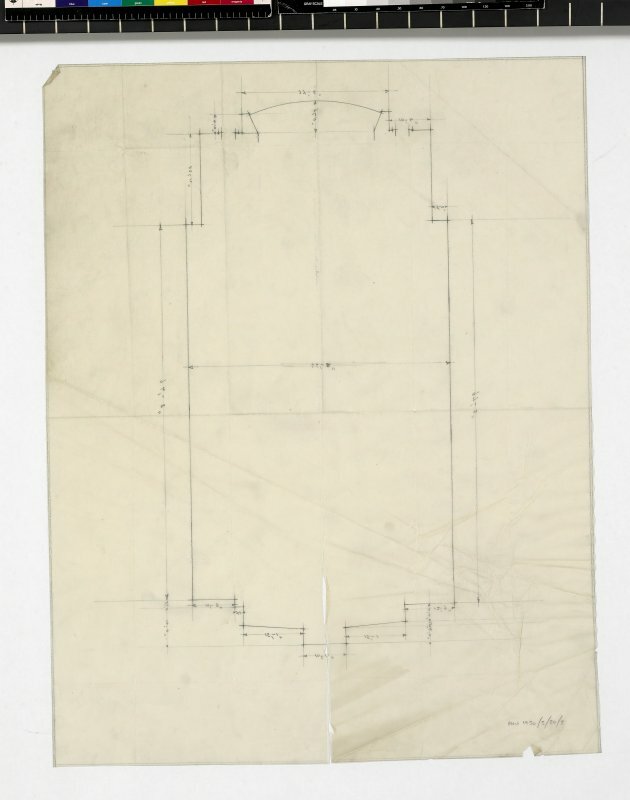 There is a tripartite window to the centre of the south front, divided by simplified giant pilasters without capitals. 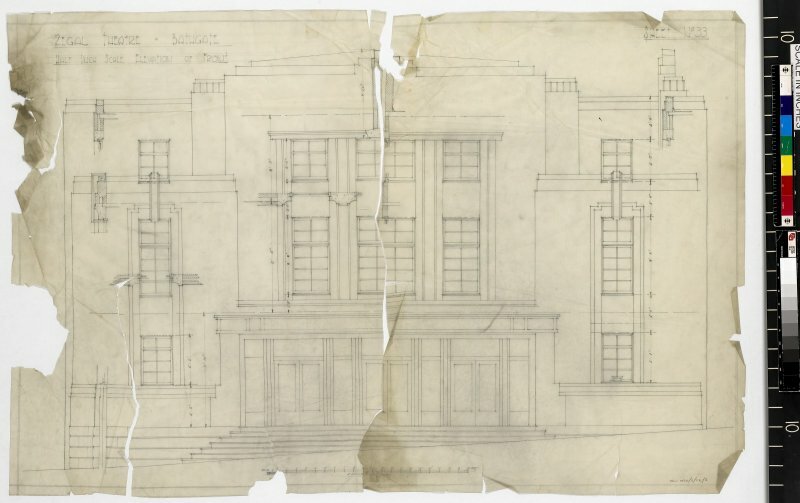 The windows of the projecting outer bays have oversized keystones breaking the eaves course above and are enclosed by mouldings with returns at the top corners. 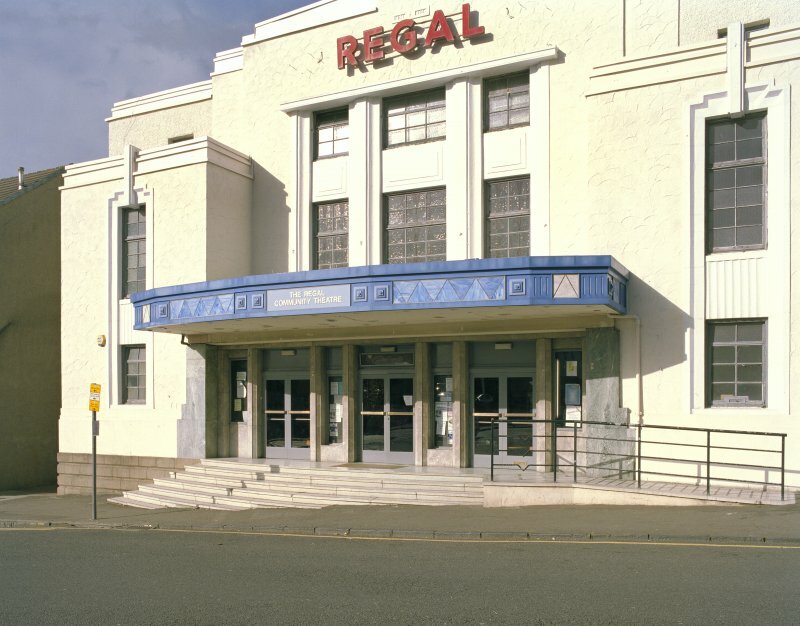 There are three two-leaf entrance doors and these are weather-protected by a projecting overhanging canopy with inset detailing and glyphic forms. 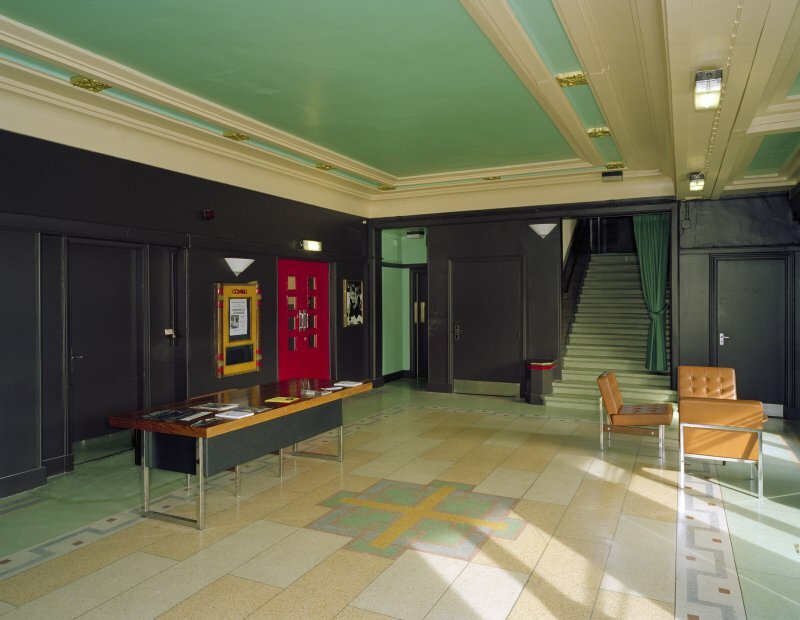 Internally, the building has undergone some alteration in connection with its conversion to a theatre in the 1990s. 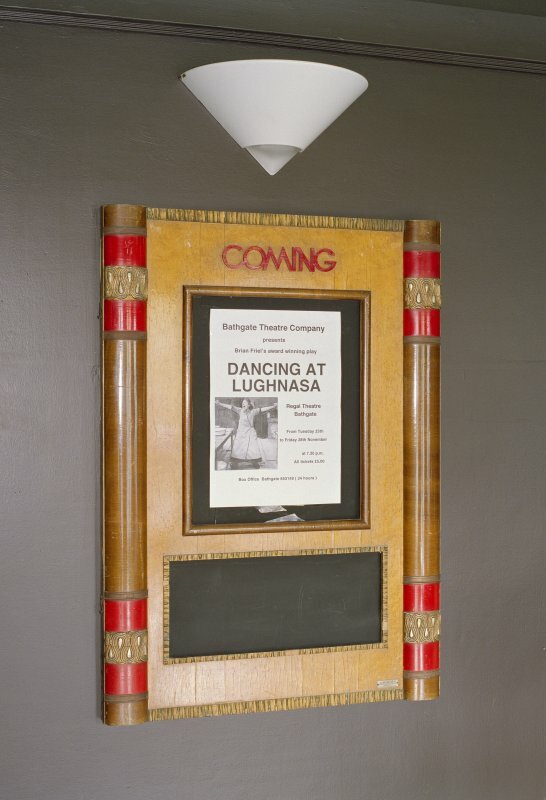 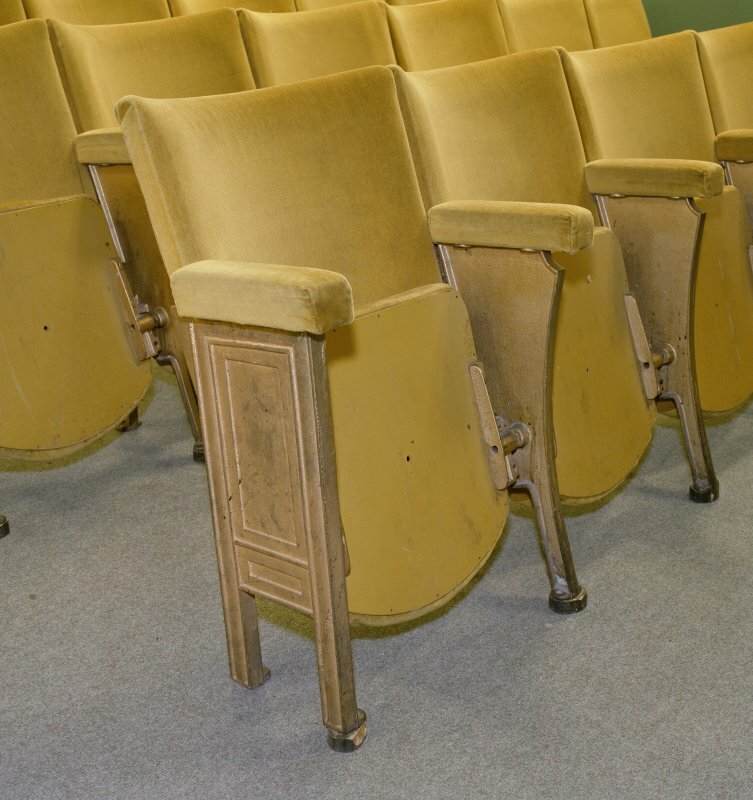 The terrazzo detailing of the floor in the foyer survives, along with other original features including poster frames to each side of the auditorium entrance. 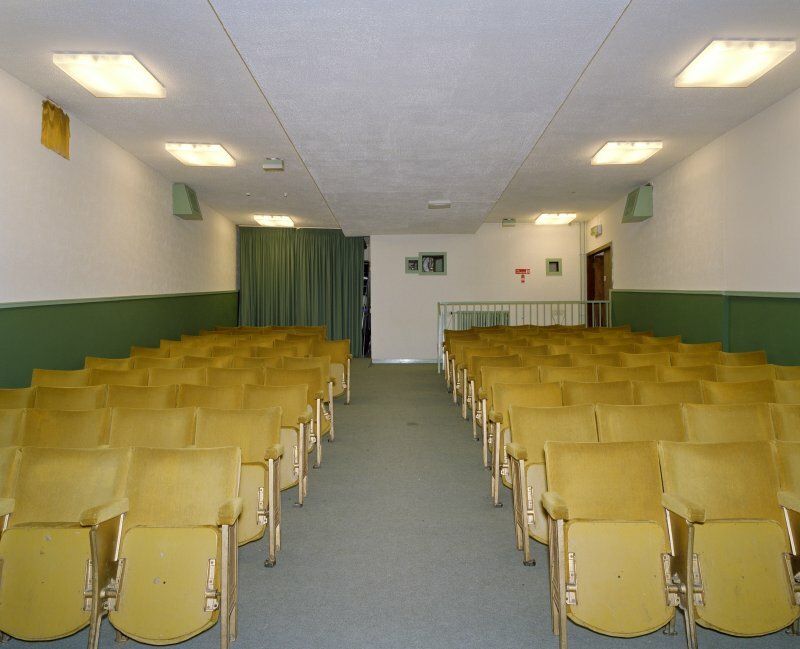 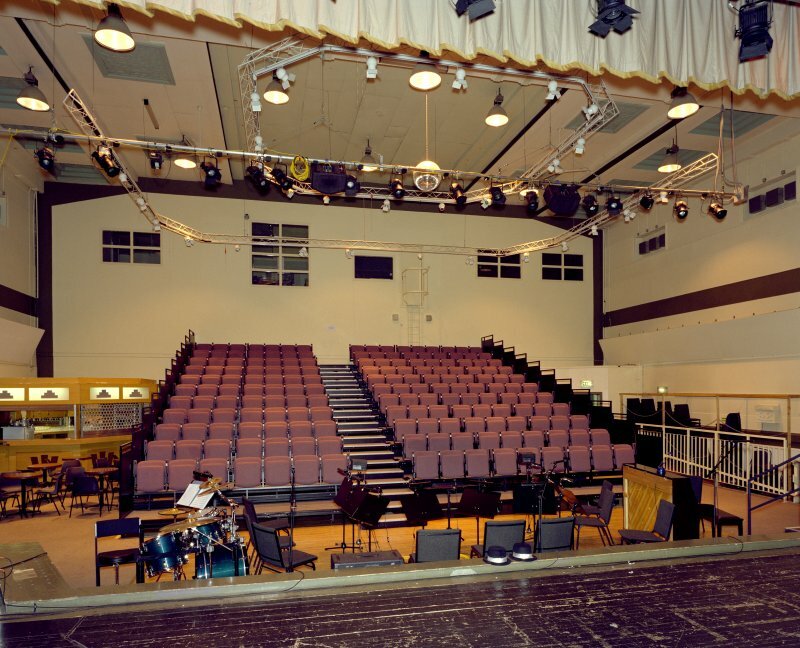 The auditorium has a ceiling with decorated coffers and a raised stage area enclosed by a heavily moulded frame. 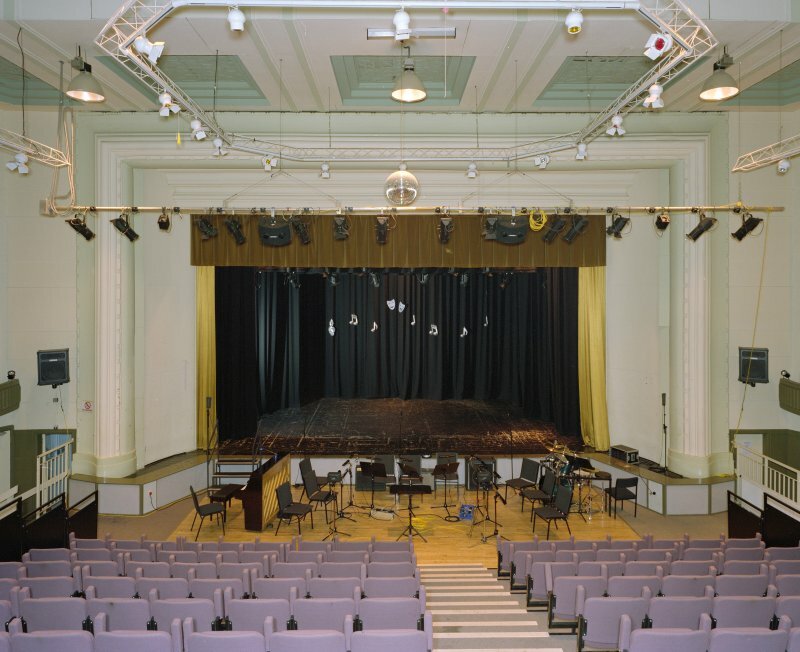 The splays to each side of the stage, above the exit doorways, are each decorated with large frames enclosing grilles and plaster figures of charioteers executed by John Alexander of Messrs N Alexander and Sons of Newcastle-upon-Tyne. 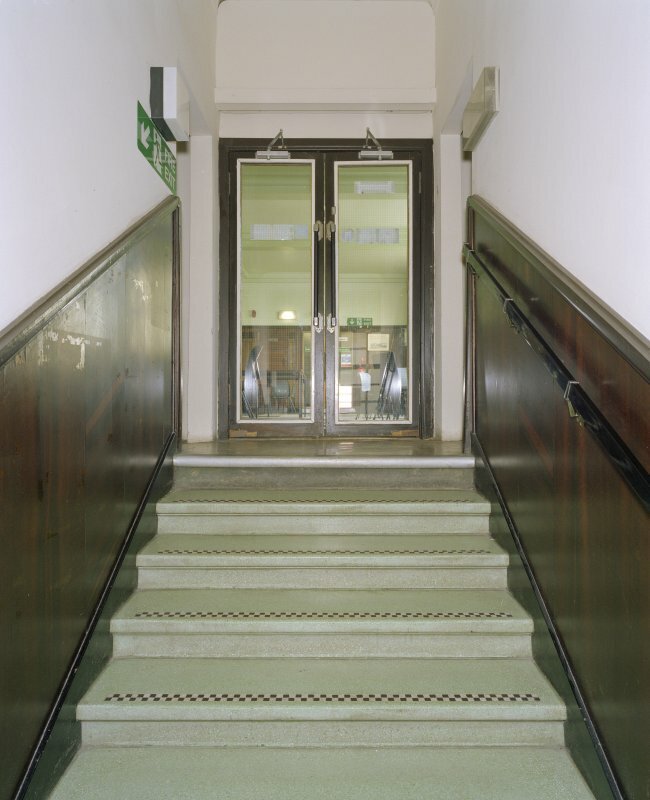 Access to the facilities on the first floor, which include a bar and lavatories, is provided by staircases to the east and west sides of the foyer. 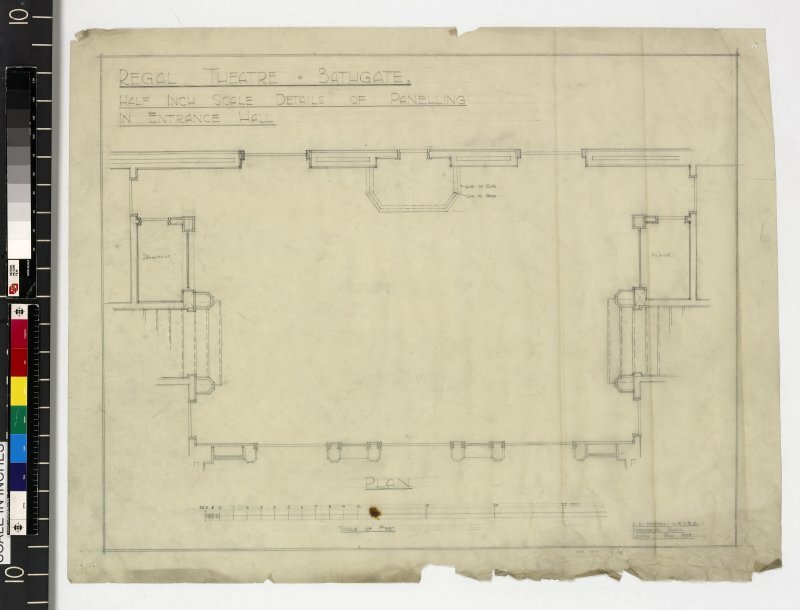 The first floor landing is lit by windows to the south front which have decorative stained-glass and the walls have a high dado of veneered wood. 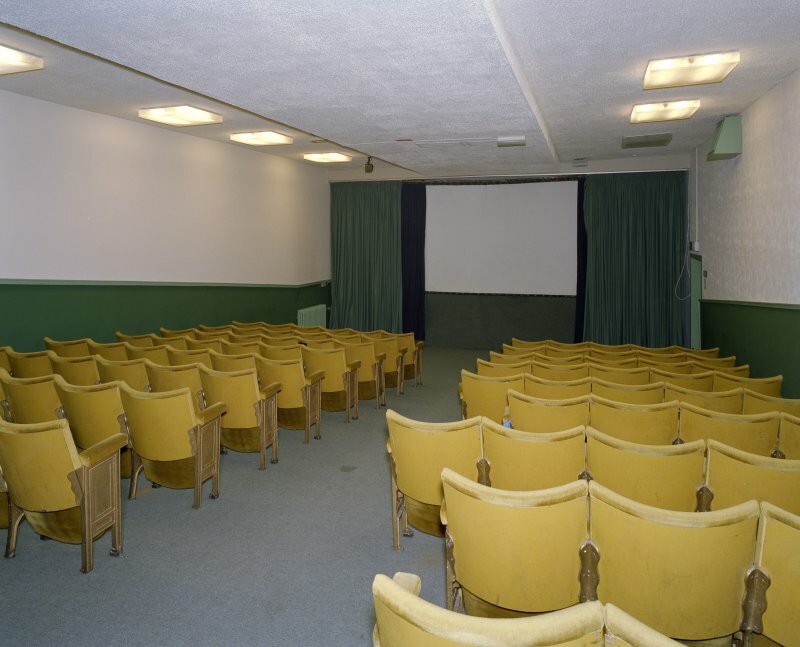 An original projection room survives.